1. For the cake, preheat the oven to 180C/350F. Grease and line the bases of two 18cm diameter sandwich tins with baking parchment. 2. Beat together all the cake ingredients in a large bowl with an electric hand whisk until well combined and smooth. 3. Divide the mixture between the cake tins and gently spread out with a spatula. Bake for 20-25 minutes until an inserted skewer comes out clean. Allow to stand for five minutes before turning onto a wire rack to cool. Peel off the parchment paper. 4.For the filling and topping, beat the butter and gradually add the icing sugar. 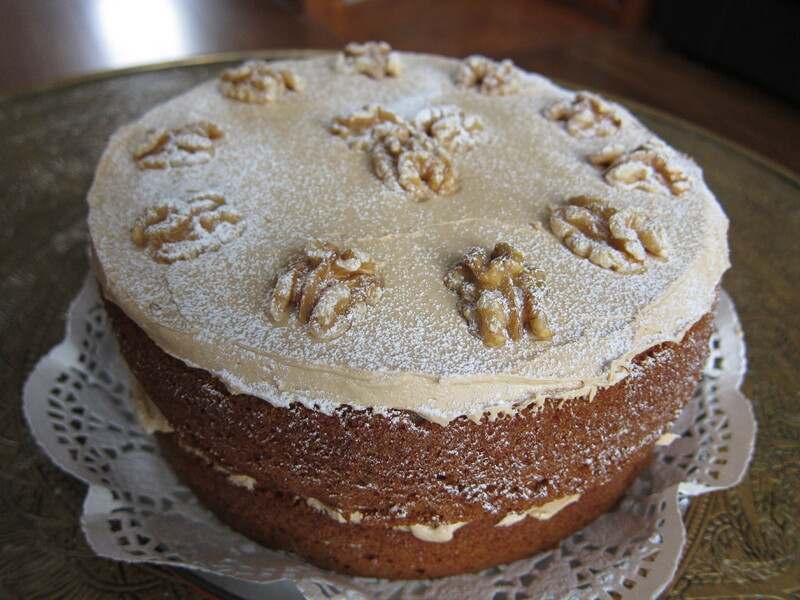 When all the icing sugar is added, add the milk and coffee and beat until smooth. 5. When the cakes have cooled, spread half the coffee icing on one cake and sandwich together with the other half. 6. 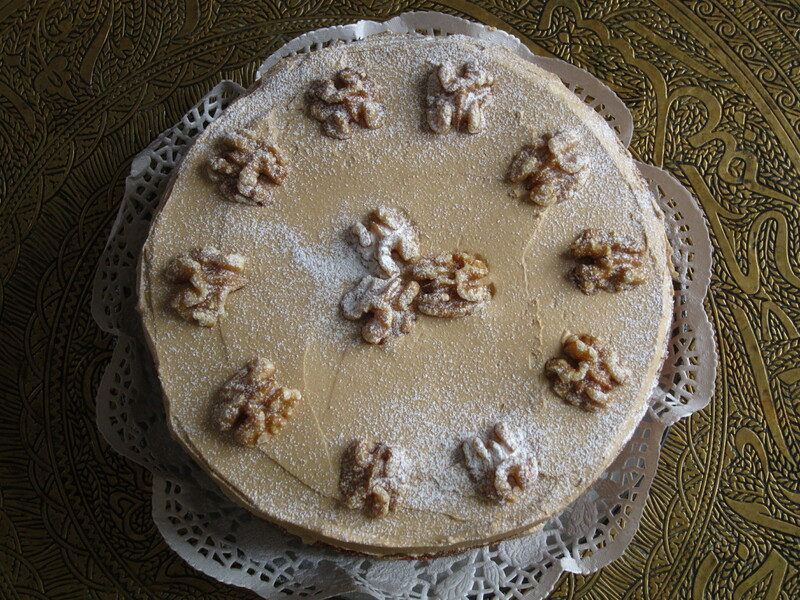 Spread the top of the cake with the remaining coffee icing and decorate with walnut pieces. I got a book by Sophie Wright for Christmas this year and this was the first recipe I saw in it. It took me a while to come around to make it 🙂 but it was on my mind ever since. I have to admit, I am not a big beef eater but lately I had a weird craving for it, so I did experiment with few ways of cooking it and this recipe was one of them. Perfect for a cosy night in without any fuss! 1. Preheat the oven to 160ºC if oven cooking. Place a heavy-based casserole dish on the stove and add the oil. 2. While the pan is heating up over a high heat, put the diced beef into a bowl with the flour and coat it well in the flour. Gently lay the meat into the hot oil and fry in batches until all the meat is golden brown. 4 minutes per side should do it. If cooking in batches, remove the first lot before doing the next. 3. Turn down the heat to medium and add all the meat back into the pan and add the onion and garlic and cook for 10 minutes. Coat the onion in all the juices in the bottom of your pan and add 100mls of water or beef stock. Scrape the bottom of the pan as the water boils to try to release some of that lovely flavour from sealing the meat. 4. Now add the ginger and chilli powder or paprika, season with salt and pepper, then add the peppers, Worcestershire sauce, brown sugar,chopped chillies, chopped tomatoes, kidney beans and vinegar. Bring the stew to the boil, place on a lid and cook in the preheated oven for 1 & 1/2 hours. (You can also cook it on the top of the stove over a very low heat which will take around about the same time, just make sure you stir it every half an hour or so to prevent it from burning. 5. Add a little more water if you think its getting a bit dry. 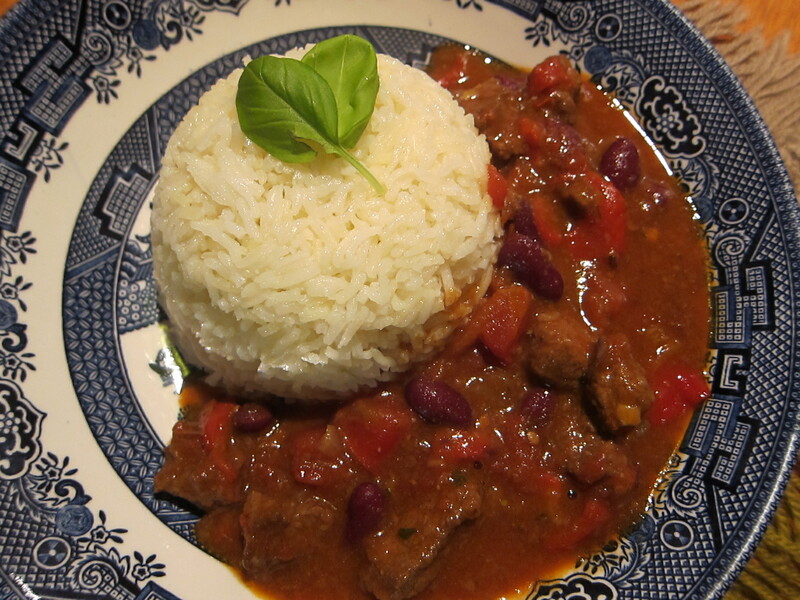 The beef should be seriously tender when the stew is ready and the sauce will be thick and sticky. Serve with rice, mashed potato or a crispy-skinned jacket potato and lots of sour cream. 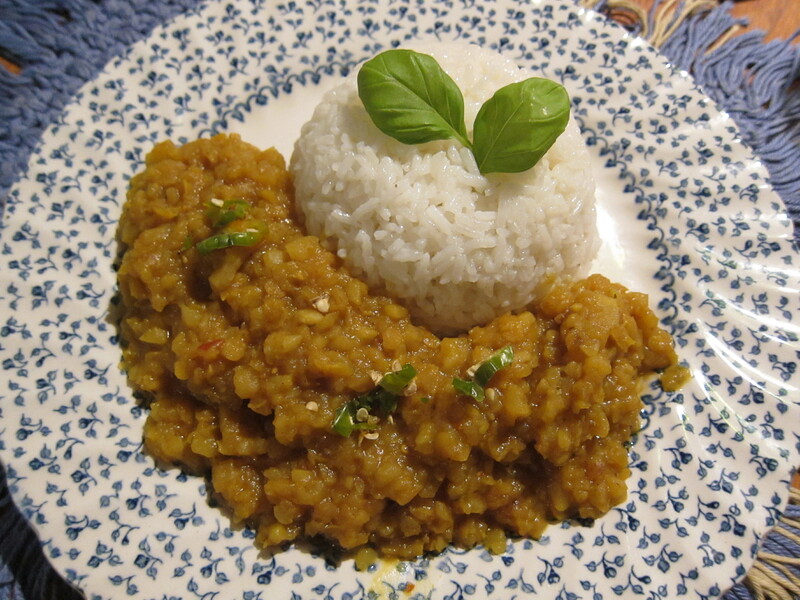 Andrea from the amazing Ten More Bites blog, of which I am a regular reader, recently posted her recipe of Lentil and Parsnip Dhal which took me completely by surprise. For some reason I never ever thought of putting a parsnip in a curry. How wrong I was, because it’s a perfect fit for it, as the sweet flavour of parsnips goes very well with the Indian spices in this dish. From now on, I’ll never see the dhal in an old way again. As soon as I saw Andrea’s recipe, I couldn’t wait to try it. I had all ingredients but coconut milk, however, I went ahead and made it without it. To compensate the lack of coconut milk, I added just more water and instead of chopping the parsnip finely, I used an electric chopper which gave me even finer consistency, so it made the dish much creamier. Also, I like to add in any curries 1 tablespoon of vinegar, which gives a dish a nice tangy kick. 1. In a heavy pot, heat the oil over a medium flame. Add the onion and sauté until softened. 2. Add the garlic, turmeric and chilli powder and cook a couple of minutes more. 3. Stir in the lentils and parsnips. 4. Add two cups of water and bring to the boil. Reduce the heat a bit and simmer for 15-20 minutes until the lentils are tender, adding more water if necessary. 5. Stir in the rest of the water (but do add more if the consistency looks too dry), vinegar, season to taste with salt and pepper, and warm through. 6. Garnish with coriander and serve with basmati rice or chapatis. 1. Preheat the oven to 170C. Line two to three baking sheets with parchment. 2. Sift the flour, cocoa powder, salt and bicarb soda together in a bowl. Mix thoroughly to distribute all the ingredients. 3. Using an electric mixer, cream the butter, both the sugars and the peanut butter until light, pale and fluffy about 3 to 4 minutes. 4. Add the egg and mix until incorporated. Scrape down the sides of the bowl as when needed. 5. Add the dry ingredients until mixed and a dough is formed. 6. Put the extra 40 grams caster sugar in a small bowl. Roll the dough into 4-5 cm balls. 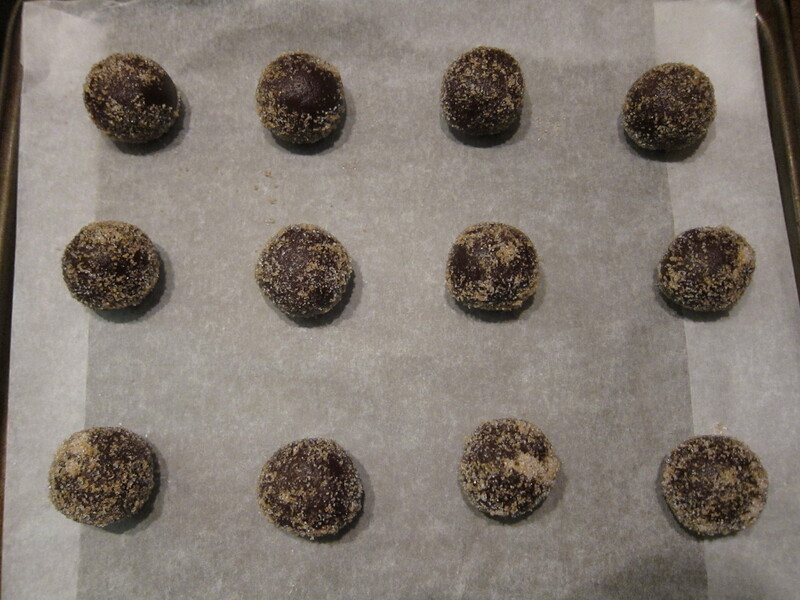 Roll each ball in the caster sugar and place on the baking sheet, keeping them about 4 cm apart. 7. 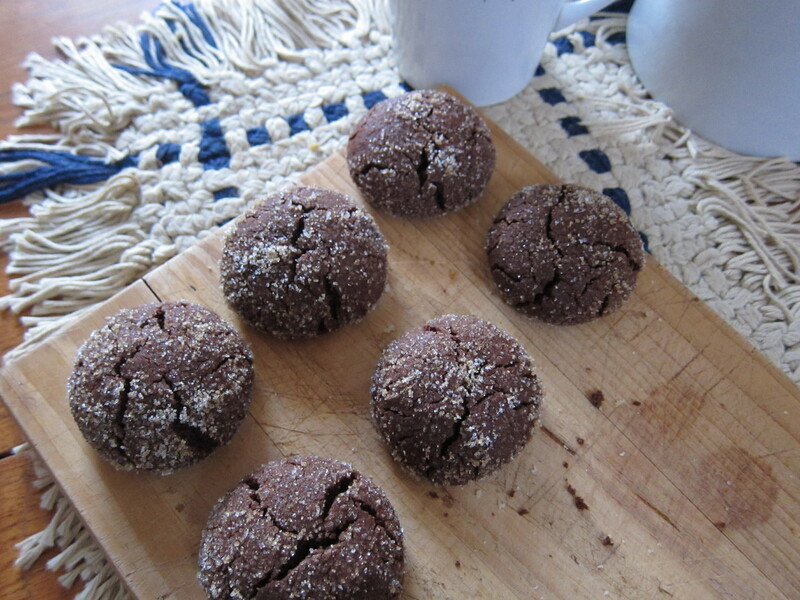 Bake for about 10 to 15 mins or until the cookies have a crusty surface and have developed cracks. 8. Place the baking sheet on a wire rack to cool for 10 minutes. 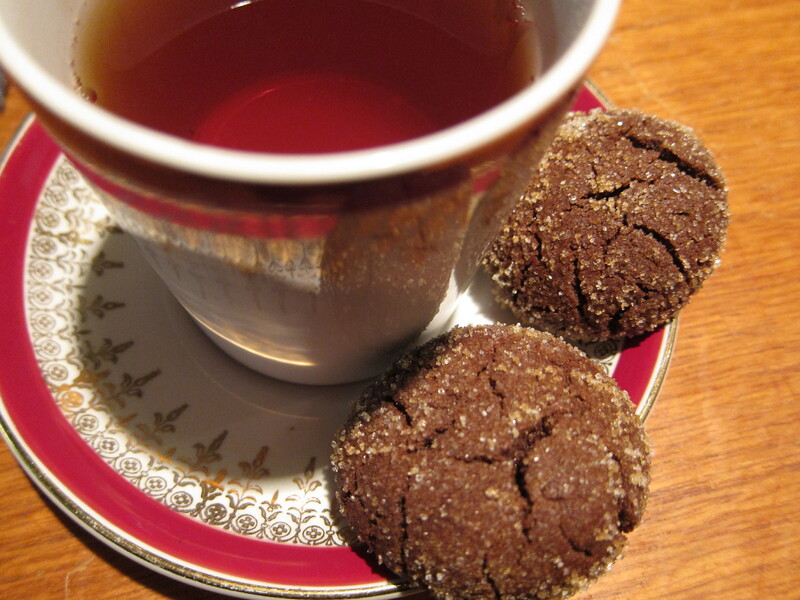 Remove the cookies from the sheet and place them on a cooling rack to cool completely. 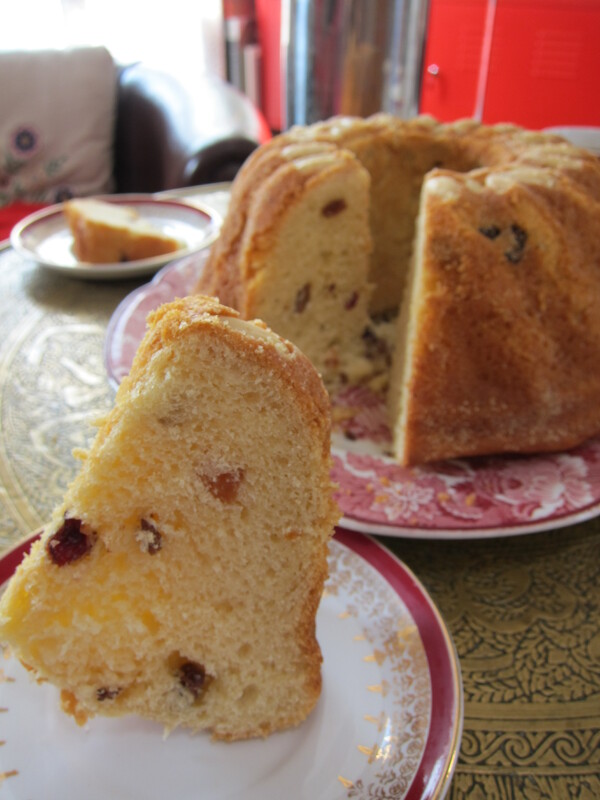 I made my version of Kugelhopf this Easter and although it originated in Austria, this sweet raisin-filled yeast bread reminds me very much of a Russian kulich which is typically served at Easter and which reminds me of my childhood. It is a cross between a bread and a cake with a slightly sweet crumb. Add raisins, mixed peel, or chocolate chips to the dough too if you like for added flavour! 2. In a small bowl whisk together eggs, marmalade, pinch of salt and melted butter, then add this into the yeast & milk mixture, followed by flour. Mix well with the wooden spoon. The batter will be quite sticky and sloppy but it should be this way. Cover the bowl with the clean cloth and let rise in a warm, draft-free spot until doubled in bulk, about 1 to 1-1/2 hours. 3. 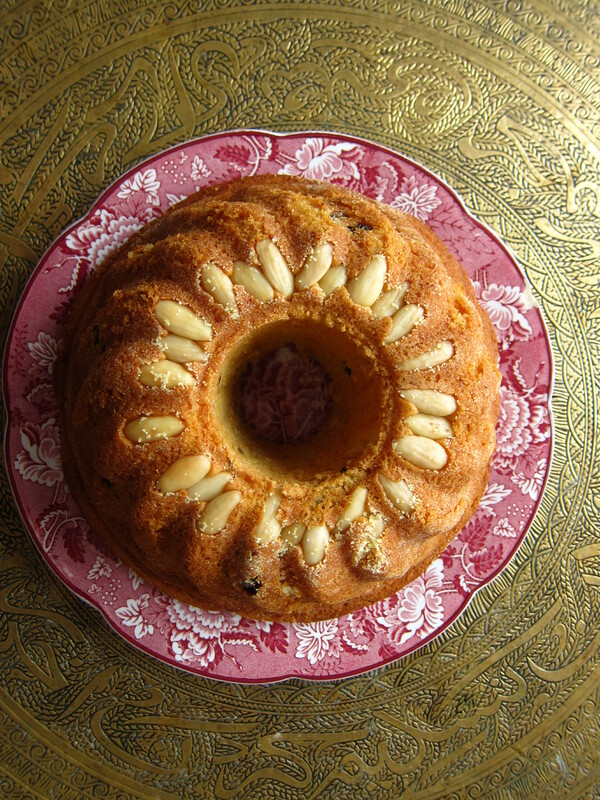 Heavily butter a standard Kugelhopf mould or any favourite mould tin and sprinkle almonds on the bottom of the mould, set aside. 4. After dough has risen mix in the raisin and orange peel and pour or spoon the dough into the mould. Cover the mould with the cloth and let rise again, this time for about 30-40 minutes. 5. Bake in a preheated oven at 180C for about 40-50 minutes until nicely browned. Remove from the oven and let stand for at least 5 minutes in the pan, then invert onto a cooling rack. I would like to say thank you to everyone who follows this blog and takes the time to read what I have to share. Here’s to another year & happy eating! 1. Preheat the oven to 200C, and butter liberally 8-10 mini moulds/mini pie tins. 2. Beat the eggs and sugar with the mixer until light and creamy (aprox 3 minutes), then add in the flour and cocoa powder, continue to beat until well incorporated. Pour in the melted butter and beat for a further few minutes until it looks like smooth, dark, rich batter. 3. Spoon 1 large tablespoon batter into each of the prepared moulds, then place 2-3 raspberries in the middle of each mould and top with a further tablespoon of cake batter. 4. Bake for approximately 10-12 minutes or until a skewer comes out dry. Allow to cool before removing from the moulds. 5. 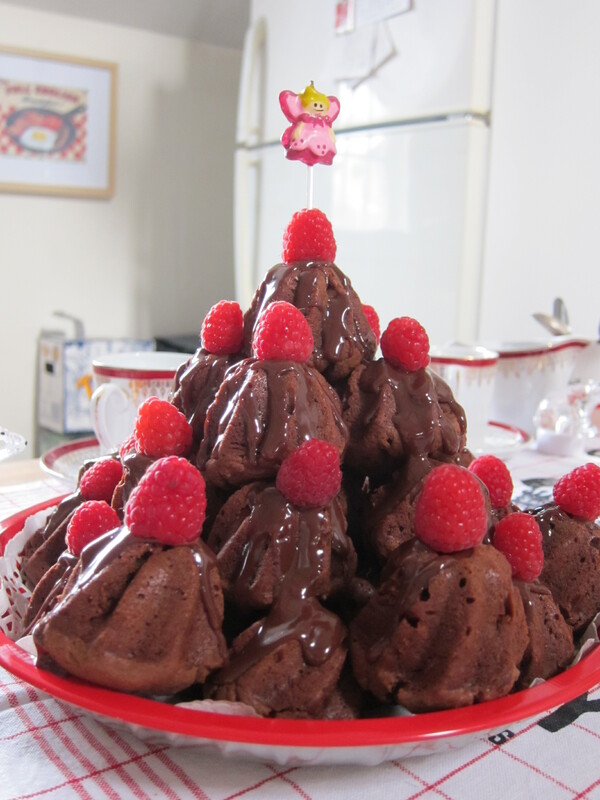 Meanwhile prepare the chocolate sauce. Gradually heat the chocolate and double cream over a low heat stirring constantly. 6. 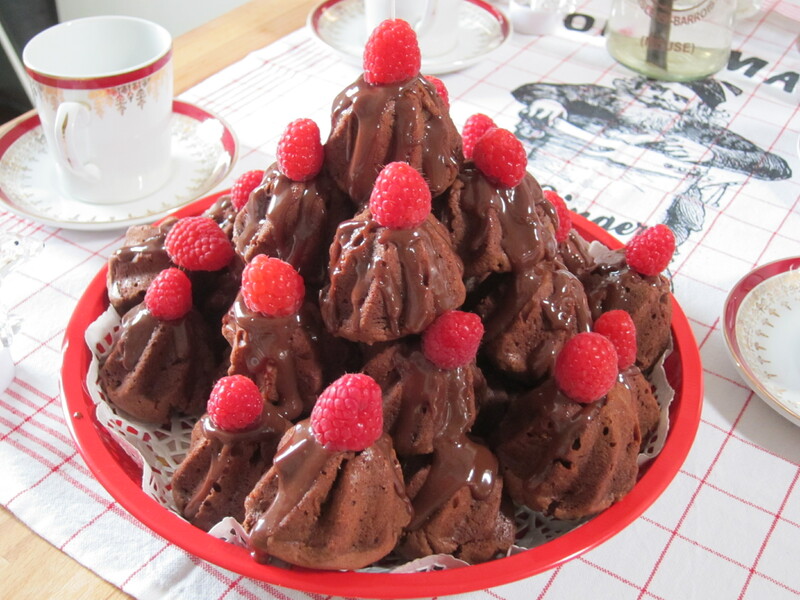 Remove the cakes from the moulds, drizzle over with a hot chocolate sauce and decorate with remaining raspberries.